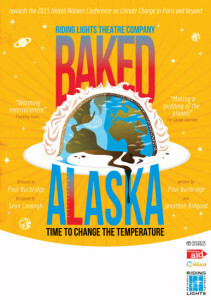 Baked Alaska, a work for theatre produced by Riding Lights is coming to the Southwest in October. Vivid, sharp and deliciously entertaining, Baked Alaska serves up the reality of climate change with flair and clarity about the temperatures involved. From the four corners of the earth come colourful, inter-connecting stories of humanity living with the wild, unpredictable effects of climate change. This production will be of interest and relevance to the whole community. Dates and venues for our region are as follows. Check the Riding Lights website for booking information and final details. This entry was posted in Bath & Wells, Bristol, Climate, Dioceses, Exeter, Gloucester, News, Salisbury, Truro, Winchester. Bookmark the permalink. Both comments and trackbacks are currently closed.